4Libra Man: Unrealistic Expectations Or Fear Of Failure? 7Aries Woman: Heart Or Head? 9Capricorn Woman: There Go Your Opportunities! 15Leo Woman: Victory Bells Are Ringing! 19Taurus Woman: Let The Sparks Fly! September is the month of the fair maiden signs: the Virgo and the Libra. And with the sun traversing through these signs, this month’s energy firmly revolves around hard work, practicality, and stable relationships. Even in your romantic relationships! Think it sounds dull? Don’t be so quick to judge. After all, it’s great to feel passion course through your veins when you fall in love, but it’s dedicated action and practical day-to-day decisions that actually help lovers stay in love for years on end. But how will this practical energy affect each of the 12 Astrological signs in their individual love lives this month? And what lessons will they learn by the end of September? 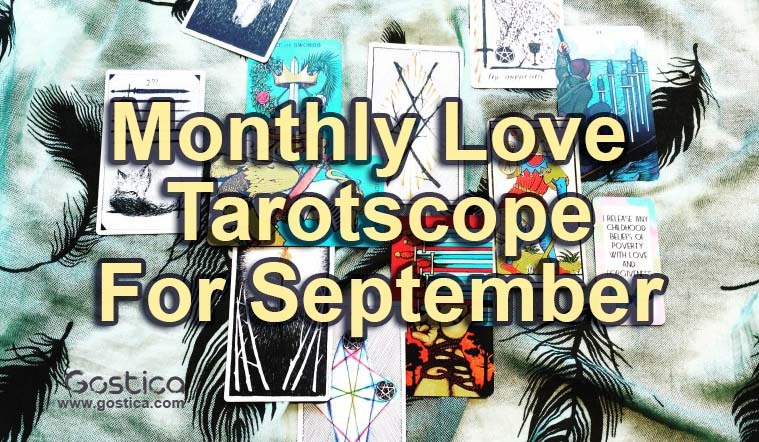 To answer that, we turn to our trusted deck of Tarot cards to reveal what September has in store for each sign’s love life (both his and hers). Some will have to deal with heartbreaks while others will realize that the one for them was always right before their eyes. But there’s only one way to know whether that’s the future written in the stars for you. So are you ready to find out what the future has in store for you? Sorry to break it to you, Cancer woman, but the one you have trusted with your heart is actually manipulating you. They might be doing it because they think it’s for your own good, but that doesn’t change the fact that they are assuming that you are incapable of making decisions that will impact your life for better or for worse. Well, the Reversed King of Swords can also mean you are currently in a relationship (whether committed or not) with someone who doesn’t have your best interest at heart, but that’s something only you can figure out. No one can accuse you of being impulsive, Cancer man. Neither can they accuse you of not saving for the future. The Reversed Page of Pentacles tells me that we are right on both counts because you made some investments for your future life with your partner a while back and those investments are now growing considerably with a chance of positive returns coming your way by the end of this month. So if you want to keep it a secret from your partner, for now, that’s your call. But don’t hide your happiness when you realize you made the right decision by choosing to safeguard your collective future. Happiness is infectious, don’t you know? Fights are inevitable in every relationship, Libra woman, whether it’s a relationship with our parents, siblings, friends, or romantic partner. So don’t be scared of the 5 of Wands that has shown up for you this month. Conflicts are necessary. They air out grievances that could undermine your relationship if allowed to fester for too long. So if you have been holding onto annoyances, now’s the time to speak up and let your partner know the pain points. And if you are blissfully happy, now’s the time to ask your partner if they have any grievances that they haven’t told you about. Trust me, the small things are precisely the reasons why good relationships end if not discussed and resolved soon. Libra Man: Unrealistic Expectations Or Fear Of Failure? Libra man, you have always craved a romance that lights up your life from within and makes you feel like one half of a power couple. Well, the 7 of Cups tells me that while dreaming about that ideal relationship you never actually considered the fact that you might have to deal with conflicts where your partner wants something you do not want. Well, this month you will find yourself face-to-face with one such area of conflict where you will feel your partner is being unrealistic about the future. But is that true or is it just your fear of failure and internal inadequacies that are making you feel like those dreams are unattainable? The Tarot card that has shown up for you this month, Scorpio woman, is the 10 of Pentacles, which is a card of material fulfillment. That means this month you will most probably end up discussing with the one you love where you want your relationship to go in the future. And by that, I don’t mean small things like living together or getting married. Rather, this card indicates a need for talking about big things like your combined ambitions, standing in society, and the empire the two of you want to build together. Sounds like a thought-provoking discussion is in the cards! Relationships can be demanding, Scorpio man. After all, they tend to fall apart the minute you become indifferent or complacent. But what if all the hard work you have been putting in to create a strong relationship seems like it’s not leading you anywhere? Well, the Knight of Pentacles is asking you to remain patient and keep plodding away slowly and steadily. You may not see the fruits of your labors this month, but rest assured, your hard work will pay dividends pretty soon in the future in the form of a relationship that fulfills you and your partner equally. Aries Woman: Heart Or Head? Aries woman, the Tarot card that has come up for you is the Reversed Two of Swords. That means this month you will find yourself at a crossroads in your love life. Whether single or attached, this month you will face the toughest decision of your life. And it will be a decision of head versus the heart. One part of you will want to stay with this person who has awoken something deep within you while the other part will want to let them go because it’s safer that way. And the funny thing is, you already know what the answer is. You are just afraid of admitting the truth to yourself. You know you are combative in nature, Aries man, and you can’t help but be that way in your romantic relationships as well. After all, there always is a winner and a loser in a fight, and you refuse to be the one with the losing hand in the conflict. Unfortunately, this competitive nature often ends up estranging your partner, because how can you love someone who treats you like an enemy when you fight? Well, the Reversed 5 of Swords foretells a crushing defeat in your love life this month. But don’t lose hope. It’s a crushing defeat only when you perceive it that way. It’s much better to see it as a learning experience. Capricorn Woman: There Go Your Opportunities! You will find yourself in a pensive state in your love life this month, Capricorn woman. Almost like you want everyone to just leave you alone so you can mope around in peace. That’s the future the 4 of Cups foretells. Whether that’s because your heart is broken or because you were burned on a date, doesn’t matter. What matters is that you know this tendency now and try not to let it drown you. Why? Because you might end up passing by a golden opportunity for your love life just because you were too busy in your personal pity party. The Tarot card that has shown up for you this month is the Reversed Judgment, Capricorn man. And that tells me that you will wake up one day and realize you are in love. How you will get there is not mentioned. Only that life will create certain circumstances in your love life that will suddenly make you realize that you have never felt this alive in your life before! Isn’t that wonderful news? Well, knowing you, you probably are shrugging your shoulders right now and saying that you will say it’s wonderful when it actually happens. To that we say: just wait and watch, you practical man! You have a tendency to run away from conflict and tough situations in life, Gemini woman. But the thing with life is, it keeps sending us the same problem in different guises until we confront it head-on and learn the lesson it’s trying to teach us. In this case, it refers to romantic partners who have the same fatal flaw (according to you) and with whom you always have the same type fights over and over again. Well, the Reversed Hierophant foretells that this month will be a challenging one for your love life once again. So are you going to run away again or are you going to learn the lesson this harsh person is trying to teach you? The Tarot card that has come up for you this month, Gemini man, is the Reversed Hanged Man. And since it’s a Major Arcana card, its message can have a life-changing impact on your love life. So here it is: you have been in a romantic limbo for some time now. It could be because the one you are dating is flaking on you or because your partner has asked for some time away from the relationship. Whatever the exact reason might be, you have been left hanging by the one who has your heart and that is causing you a lot of pain and anxiety. Avoiding the truth isn’t going to make it go away. Instead, you will fare much better if you accept this reality and then ask yourself if you are okay with being in limbo or not. Whatever the answer is will tell you what you need to do next. Hold on tight, Virgo woman, because Fate is turning its wheel once again and we aren’t sure what that will bring into your life. All we know is that the Wheel of Fortune is a Major Arcana card and so you can expect something to happen in your life this month that will have massive repercussions down the line. Positive or negative no bar. Just remember: we attract what we think of constantly. So if you are worried this could mean a bad breakup or spinsterhood forever, it just might become a self-fulfilling prophecy. So keep your thoughts under control and hope for the best. The Tarot card that has shown up for you this month, Virgo man, is the 3 of Cups, the card of celebration and friendship. That means this month will be a very social month for you with a lot of friends either coming over to hang out or planning a reunion of sorts. And if you are single, don’t be surprised if these celebrations end up turning a friend into a romantic partner or introducing you to someone who asks you out. And if already committed, you will find yourself introducing your significant other to all the important people in your life – your best friends. Leo Woman: Victory Bells Are Ringing! The Tarot card that has turned up for you this month, Leo woman, is the 6 of Wands. And get ready to feel like the warrior queen on the card who has won her place on the throne after a grueling battle with those who were after the same prize. By the end of September, you too will feel victorious in your love life. It could be because the one you had your eyes on for some time now finally becomes yours by the end of the month or because your partner finally drops down on one knee and proposes marriage. However it plays out, your struggles are finally going to come to an end this month and you will be victorious. Most people make wishes, drop a coin down a wishing well, and then do nothing about it. Well, you aren’t most people, Leo man, and this month will show you exactly how different you are when you embark upon an adventure with your romantic partner that no one has ever tried before. At least, not the sheep disguised as people. How do we know this? The 3 of Wands, the card of adventure and expansion, turned up for you, that’s how! Did that fill your head with wonderful and creative ideas? We hope it did. An awesome month is ahead of you, Sagittarius woman. But before you get too excited, here’s the deal: it’s not the awesomeness of spontaneous adventure or fun trips. Instead, this month you will find yourself building something massive with your partner (or the one you are dating). And while the process will require a lot of hard work, the two of you will attack it with gusto like a good team and conquer the project in the end. Doesn’t that inspire you? Knowing you, I am sure your mind is already churning out big ideas to get to that bright future. You are not what people would call a nurturing presence. That’s the domain of the Taurus and Cancer man. Nevertheless, you will find yourself engaging that side of you this month, Sagittarius man. How do we know this? The nurturing Queen of Pentacles has turned up for you this month, that’s why! And her message for you is this: love is about giving, not taking. So if you truly love the one you are with, show them that through your actions by taking good care of them in your day-to-day life. It could mean nursing them to health when they are sick (the season’s changing, after all) or treating them like a princess. Whatever you do, do it with love and care. Taurus Woman: Let The Sparks Fly! Hurray, Taurus woman! Because the Reversed Ace of Wands has shown up for you this month. That means this month you will find your heart warming up like a campfire in the presence of an unexpected person. So if you are single, you can expect to find yourself falling for someone you just started dating a while back. And if already in a relationship, you can expect the flames to be rekindled between the two of you by a surprising act of passion. Did that put a smile on your face? It sure put one on ours! The Tarot card that has turned up for you, Taurus man, is the Reversed World. And since it’s a Major Arcana card, you can expect something life-changing to happen in your romantic relationship by the end of this month. What is it, do you ask? Well, we don’t have the details, but you will realize by the end of September that the one you are with is truly the one for you. You could be hugging them when this feeling comes over you or could have just had a peaceful meal with them at your home, but it will be an instantaneous realization and it will make you feel full in your heart. Do you feel empty without your lover by your side, Pisces woman? Like you need their affection to feel whole and complete? If the answer was yes, you are in big trouble! Why? Because if you allow yourself to derive validation from outside of yourself, you will always be at the mercy of the others’ moods and reactions. So if you have been doing this, pay attention. According to the Reversed Empress, this month will be extremely excruciating for you when you feel your lover pulling away. But it will be a gift in disguise because it will allow you to find the strength within yourself and start the internal work required to love yourself first. Love can be scary, Pisces man. There’s no doubt about that. After all, you are showing your heart to someone who could easily shatter it with one ruthless word. The Reversed 9 of Cups is telling me that in your quest to protect your heart you are actually resisting a relationship that has the potential of being the best thing that ever happened to you. So stop swimming against the current! You know your heart is already claimed, so why pretend as if something epic hasn’t already happened? Besides, has your gut ever led you astray? You are a woman of intellect, Aquarius woman. That means you prefer relying on logic over gut instincts. But the Reversed High Priestess is warning you not to reject the message of your gut. Trust me, if something feels off about this person you are seeing, you are definitely right. You just aren’t watching them closely enough to collect the evidence you need to prove it to yourself. So pay close attention to your gut this month. We, humans, communicate a lot more through our bodies than we do through speech. And that’s a scientific fact! The Tarot card that has turned up for you, Aquarius man, is the Reversed 8 of Swords. That tells me you are currently in a romantic situation that is making you feel trapped. It could be because you are dating someone who is manipulating you or because you have bought into society’s misguided concepts of what a relationship looks like. Whatever the reason might be, the 8 of Swords is asking you to look within yourself. Trust me, you aren’t truly trapped. All you need is some faith in yourself and the flexibility to change the course of your life and you will be out for good from this sordid situation.